Don’t Miss... Our new tenants on the ground floor; We Are Northern Lights. mScotland's First Ever Mass Participation Documentary Film. 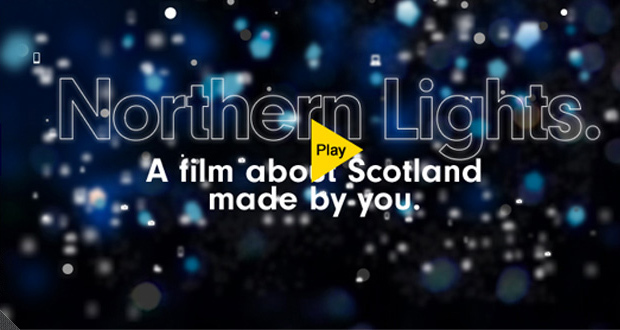 The public is invited to collaborate on a unique feature-length documentary film about Scotland. Northern Lights is a first in a lifetime mass participation film project funded by the Year Of Creative Scotland 2012, which aims to create a view of Scotland that goes beyond media stereotypes to reflect the lives, no hopes and dreams of the people who live - or once lived- on these isles. The project opened for submissions on 20th March and people of all backgrounds and ages, across all areas of Scotland and the diaspora, are invited to respond, with filmed contributions to three questions: What can you see? What do you wish you had seen? What would you like to see? The producers intend for many first-timers, as well as more experienced filmmakers, to engage with the project, and the website offers resources to help new participants plan and shoot their footage. There will also be numerous workshops taking place across Scotland to specifically support groups considered to be less likely or unable to engage in media or arts projects of this nature. Videos can be submitted from 20th March until 21st June on the Northern Lights website www.wearenorthernlights.com Videos will be featured on the Northern Lights website and YouTube channel, and will automatically be eligible to win one of the Northern Lights Awards. Awards totalling £10,000 are on offer to the most compelling contributions in a range of categories, including the People's Choice Award for the most popular contribution to the project.